I bet your looking at this, thinking what the heck can that be? Well, i'm telling you right now, it is one of the most nicest tasting desserts that has ever passed my lips! I have such a great love for Baklava, and i'm severely craving it! It's an arabic food, and the only word to describe it is delicious! Not going to lie, it's not the prettiest of foods, when i first layed eyes on it, i wasn't too keen on trying it, but seriously, it was the best thing i ever did! Every so often, when i feel like giving my taste buds a treat, i'll buy some! It's quite hard to get hold of, because obviously it's not an english food. It can be purchased from Lebanese, Turkish, Arabic or Greek shops, and i'm warning you now... it's pretty expencive.. but ever so worth it! 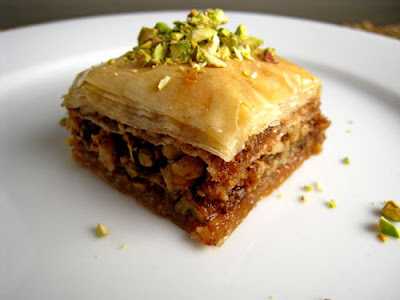 A few ingredients include, syrup, pistachio nuts, a flakey pastry, and almonds. There are many different types though. Definately going to persuade the mother to go and collect a little bit for me.